Purpose This unit is used in dental laboratories for removal of dust resulting from machining. 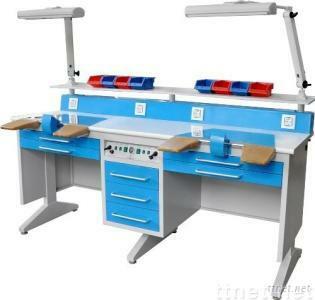 Description The EM-LT6 Workstation is designed by Aixin and Spain TECHNOFLUX, The table frame is made of steel, and the tabletop is made of high density fireproof board. It also features florescent lighting system, stainless steel plate, arm rests, retrievable air nozzle, dust extraction system, storage drawers, etc.